It can be used from 4 to 30 lbs or up to 30 inches tall. 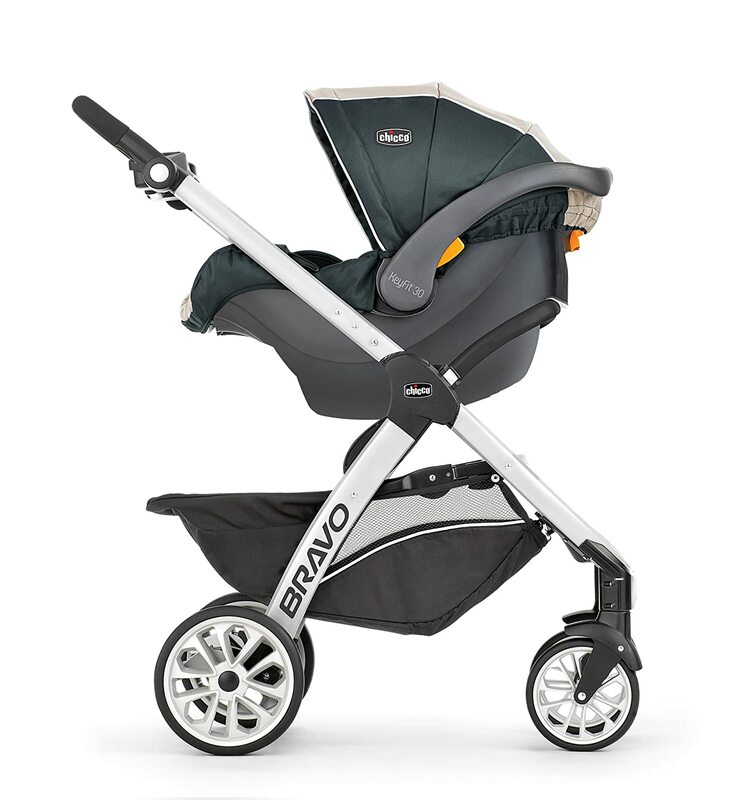 It has a stay-in-car base and is compatible with Chicco strollers. It installs simply with a click-in and click-out mechanism with both the Chicco travel systems and the car seat base. It has a leveling foot to find the perfect recline, bubble level indicators for correct, and most importantly safe, installation, and has a LATCH tightener at the back of the base to easily secure it in place. There is also an infant insert for newborn babies, the fabrics are machine washable and there is a sun canopy to protect your tot from the sun’s harsh rays. That’s what makes this a practical car seat but what really makes it one of the best infant car seats on the market? This seat fit my baby like a glove. Soft, padded cushion surround the baby’s whole body for high-level comfort, even when they’re teeny tiny. One mum said that she was nervous to put her tiny premature daughter in such a big, bulky seat, but from her first car ride home from the hospital she has slept peacefully the whole ride. As it can be used from 4lbs, it’s a great option for preemies too. The Key Fit 30 certainly isn’t a lightweight car seat, at 17 lbs, but it’s not so heavy that it’s a struggle to lift, and I find that it’s easy to manœuvre in and out of the car. Although we associate baby carriers and infant car seats with newborns you can use this seat up to 30lbs, which can be anywhere up to 3 years old. All car seats on the market have to pass certain safety tests for the country of sale, but the KeyFit 30 performs outstandingly in crash tests, and I have no concerns about my son’s safety when he’s in this car seat. I really love the click-in system and have never struggled with tightening the LATCH or even the harness. As with every car seat and almost every baby product in the world, there’s no guarantee that your baby will like it. Just like us parents, babies have their own tastes, but the chances are your baby will love this car set just like so many other babies (and parents) do. Everything has been so simple and I honestly think this is one of the best rear-facing car seats on the market, not to mention it comes in so many cute colors and patterns! To read more about infant car seats and to compare other makes and models, check out our rearward-facing car seat page. Similarly, if you’re looking for a convertible car seat, booster seat or even to find out about harness booster seats, click to read all about car seats.